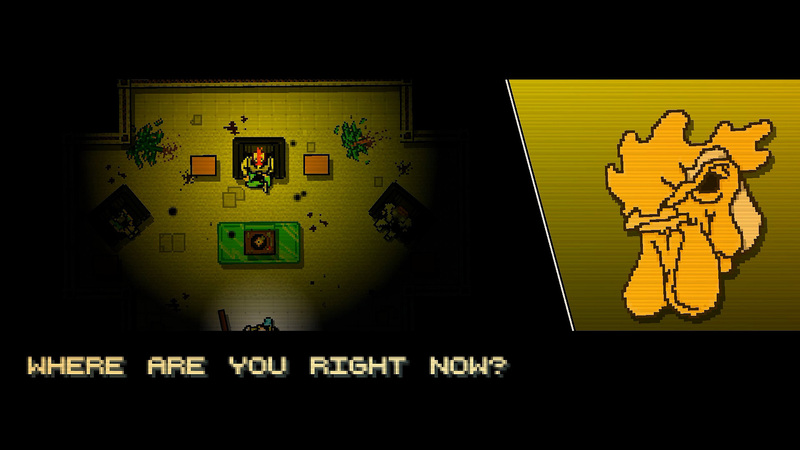 Hotline Miami – is it really that clever or subversive? It’s mostly pure coincidence that I wandered straight from playing Syndicate (see previous article) to the 2012 indie game Hotline Miami, but there’s certainly a connection between the two, even if only tenuous. They’re both unapologetically violent, both force you to commit murder for dubious reasons and both invite comparisons to GTA. 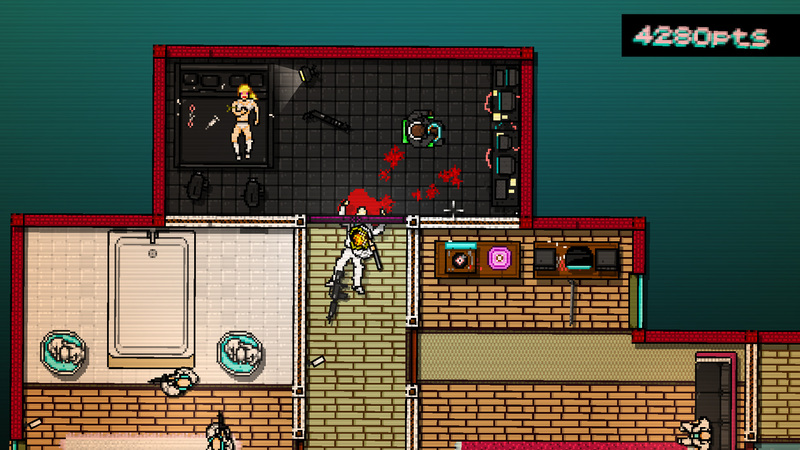 Hotline Miami, is a top-down fast-paced action game lovingly crafted in 8-bit pixel art. Swedish indie developers Dennis Wedin and Jonatan Söderström, collectively known as Dennaton, claim partial inspiration from the stylishly violent neo-noir film Drive, but it clearly owes far more to the scrolling arcade games of the late 80s/early 90s. 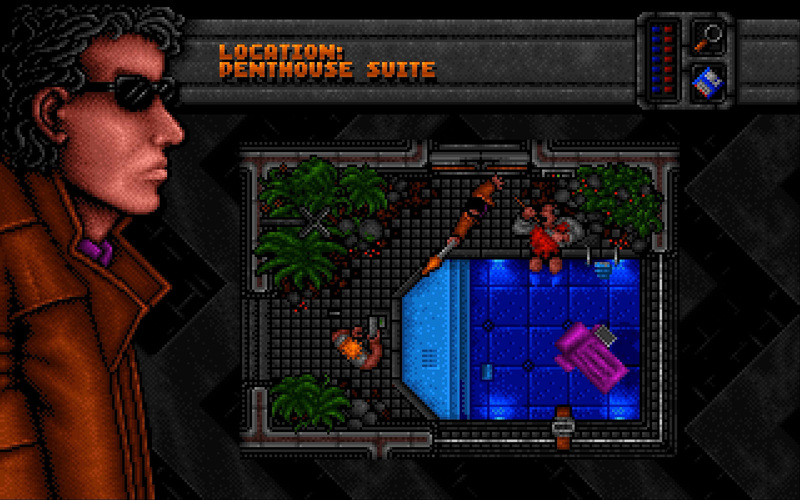 You can also see other retro game influences reflected in the graphic styling, violent 1994 point-and-click adventure Dreamweb especially comes to mind. It’s an obvious homage to a bygone era of gaming. 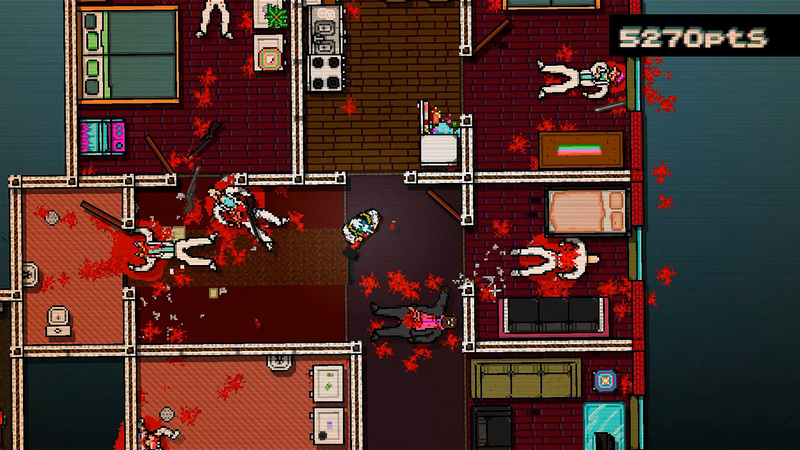 For those unfamiliar with Hotline Miami, the game is set in the seedy underworld of 1980s Miami and the narrative revolves your unnamed protagonist (“Jacket” for the majority of the game and “Biker” for the epilogue) receiving a series of mysterious telephone messages that instruct him to head to specified locations and kill everyone there. So you don an animal mask, head inside and hack, slash, shoot and door slam your way though the Russian mobsters. Like many of the old school games it’s takes inspiration from, Hotline Miami is an extremely fast paced and unforgiving game that requires sharp focus and lightning reflexes. You die in a microsecond. One mistimed swing, bad throw or shot fired wide and you’ll be lying in a massive pool of ruby-red blood with your pixelated intestines dangling out. Enemies react and move very quickly – cross their line of sight and they’ll instantly open fire or coming hurtling towards you thrusting a knife or bludgeon. This is a game where you spend a lot of time mashing the restart button. Murder on the dance floor. You die a lot in Hotline Miami. There is even an achievement for it. 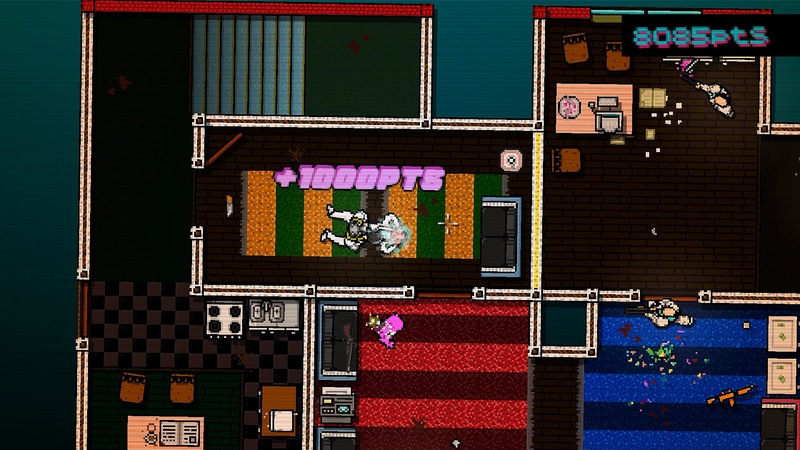 At it’s heart, Hotline Miami is a puzzle game. Like the Hitman series, it’s all about observation, strategy, timing, and flexibility. It’s more about flawless execution than the actual execution itself (pun intended). Through a process of trial and error you devise a plan, a pre-determined route through the level and when and how you will kill each enemy. Choreography, timing and efficiency of movement are key to success. But you need to be adaptive too, in order to react to the unexpected. The problem is, that’s the extent of the gameplay. It’s fun, rewarding and surprisingly addictive at first and it features an astounding soundtrack that skilfully controls the mood and drives the action. But the novelty quickly wears thin, it’s extremely repetitive and the maps all look and feel very similar – a problem it shares with many of the games it takes inspiration from. It also doesn’t take very long to complete. After that, the only thing to encourage replay is high score and achievement hunting. But there’s more to it than that, right? 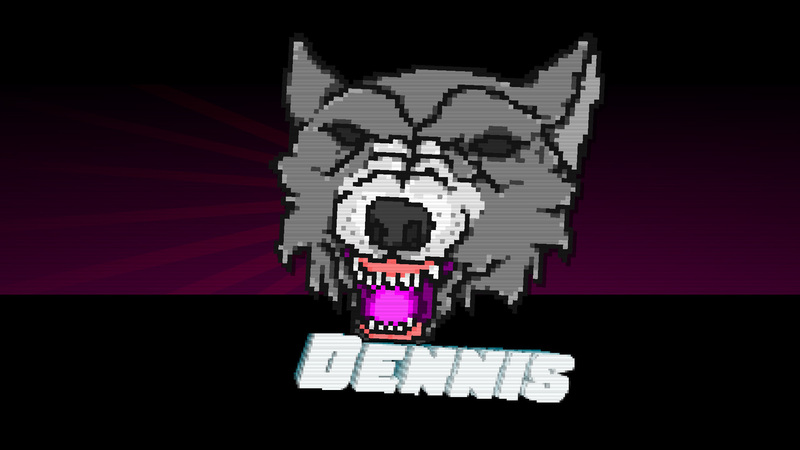 Well, part of Hotline Miami’s appeal is that it’s open to multiple interpretations, particularly as Dennaton themselves seem a little coy about offering their own. And the inherent themes surrounding the place of violence and narrative in video games are interesting, but there’s a lack of clarity, purpose and further exploration. Firstly, let’s tackle violence, something that’s very much central to the game. 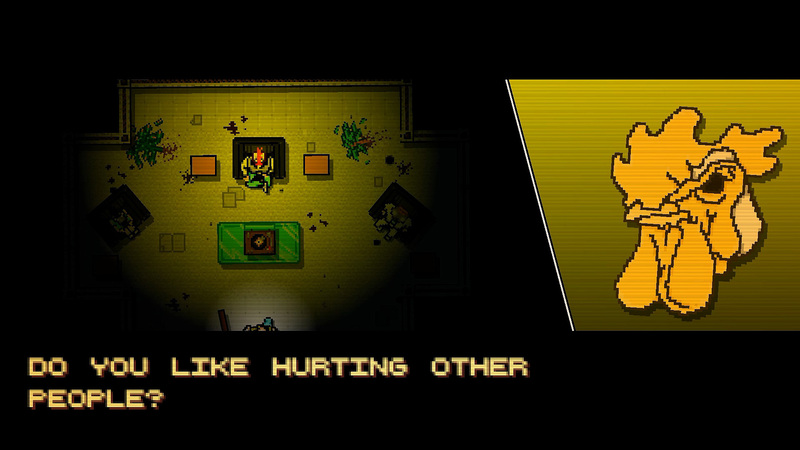 Is Hotline Miami an introspective on violence in video games? Maybe it is, but what exactly is it saying? Does it criticise you for enjoying violence in games, like so many assume? 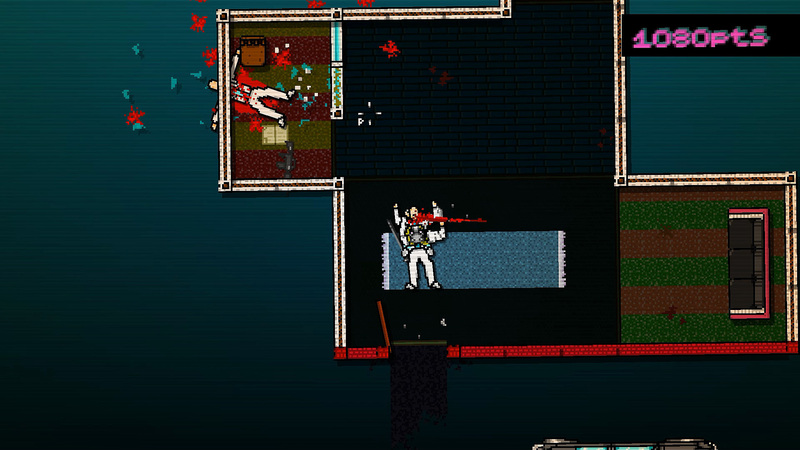 Hotline Miami revels in its ultraviolence. As you murder your way through each map you decapitate, slice off body parts, slit throats, mangle limbs, disembowel, snap necks, cave in heads, pour boiling water on faces, etc, etc. Brightly-coloured blood and gore spray with abandon. It’s all driven by the pumping techno music and pulsating psychedelic colours, with the scoring and combo system urging you to kill faster and faster – it’s a giddy adrenaline rush. Then abruptly, on the final kill, the music stops. Suddenly you’re faced with a soundtrack of menacing static as you head back to your car, forced to retrace your steps through the wake of mutilated bodies and gore-splattered surfaces that you left behind. The dissonance of before and after. I did all this? Hope they don’t expect me to clean up! Early on in the game in one of the narrative sequences Jacket is told: “you’re not a very nice person, are you?” and “you make sick”. He’s then asked, rather bluntly, “do you like hurting other people?” In an early cut-scene, Jacket is told: “Knowing oneself means acknowledging one’s actions. As of lately you’ve done some terrible things …” Many have interpreted these scenes as breaking the fourth wall – it’s all really directed at the player. But is this deliberate and forced reflection supposed to provoke an emotional response in us? For me, the violence is so OTT and cartoonish it does nothing. It’s funny and plain ridiculous more than anything else – like Tom and Jerry on acid. I’ve had stronger emotional responses to violence I’ve committed in Call of Duty games. Most importantly, there is no freedom of choice other than to play or not play the game. 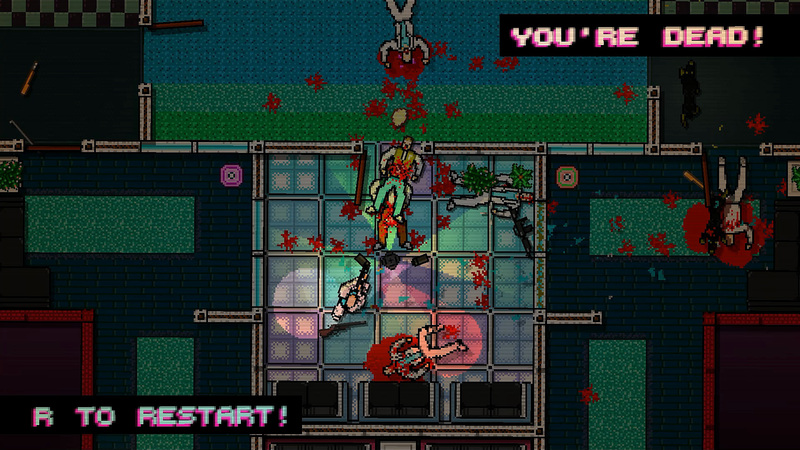 In Hotline Miami you’re forced to kill everyone including any bystanders. In contrast, in games such as Syndicate, GTA and Hitman it’s up to you whether you kill bystanders. And as a result these games do cause you to stop and question your motives. But Hotline Miami removes any moral ambiguity by making these decisions for you. Furthermore, the game mechanics are built entirely around rewarding violence. If this is a game that condemns violence, it does a poor job of it. As an aside, I do wonder whether Dennaton themselves are seeking justification for their violent creation. Besides, only with a twisted logic could you make a game as violent as Hotline Miami and then lampoon its players as being depraved for enjoying something concocted in your own mind. Should developers take no responsibility for their creation? Perhaps, then, the developers are simply pointing out to you, without judgement, that you enjoy violence in video games? That maybe so, but isn’t that just stating the obvious? It would be far more useful to ask why, which is not something the game makes any attempt to explore. Is it, then, really about a player’s need for validation for killing and maiming in games? Well, I think there is more support for this interpretation and it’s a decent point. Many games do go out of their way to demonise and dehumanise the bad guys, so repeatedly stabbing them in the face while they choke on their own blood is a comfortable and guilt-free experience. 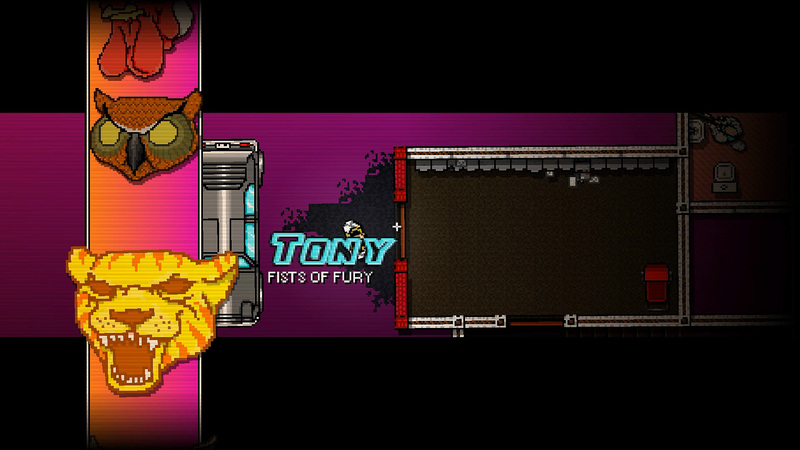 In Hotline Miami, the motivations of Jacket and Biker are, at best, ambiguous. Why did they agree to carry to out these hits? The game’s finale sees Biker confront the two telephone engineers, apparently behind all the answer messages, to demand answers. They explain that it’s all just a game, that you’re just their pawn and there’s no point to it all. It’s the weakest moment of the game – the engineers are blatant avatars of Dennaton and they’re talking directly to the player. It’s so unsubtle that it’s actually cringe worthy, not to mention smug and patronising. They’re effectively saying the killing is just a game mechanic and you did it because they told you to. True, but, as discussed earlier, the only freedom the game really gives you is to play or not to play. Perhaps if the developers had given you the freedom to progress without killing these people, but cleverly manipulated you into doing it anyway, they would have a much stronger point. Hard boiled gangster face. What Hotline Miami doesn’t really attempt explore is why violence in games (or any other medium for that matter) can be so entertaining. Further still, Hotline Miami does provide you with some justification for killing all those pesky Russians. There is evidence throughout the chapters of how cruel and depraved the mobsters are. The engineers even concede as much: “They were all scum anyway, weren’t they? You think they deserved to live? Do you?” Surely then, it would have made more sense to manipulate the player into spending the majority of the game butchering innocent people or clear-cut “good guys” rather than nasty gangsters. Evidence of the mobster’s cruelty and depravity can be found throughout the game. 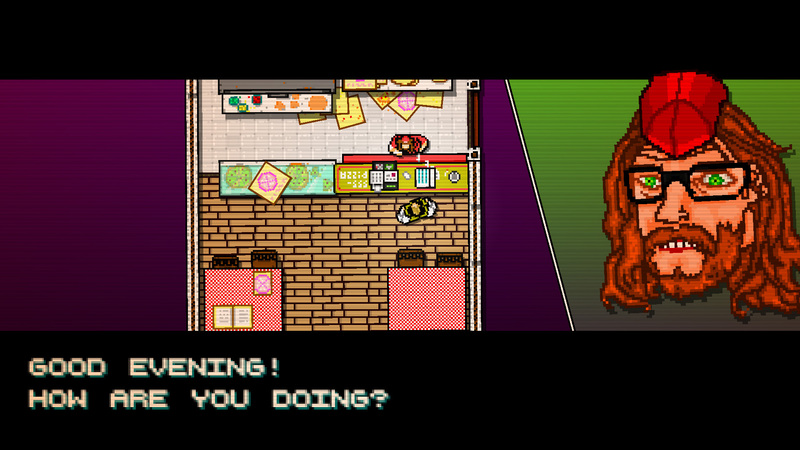 Another idea put forward is that Hotline Miami is questioning whether narrative is necessary. The narrative is certainly, for the most part, incoherent. We don’t have clear motivations for why Jacket and Biker signed up to be hitmen, plus their timelines contradict each other, or at least imply that everything that happens in Jacket’s timeline after his confrontation with Biker is little more than a dream/fantasy sequence, which might help to explain the talking corpses. And who is the bearded guy that appears in every outlet that Jacket visits after completing a mission? Why does the guy from the tutorial attack you in the alley during the first mission? What are the red symbols that you come across throughout the game? Who are the three masked persons in Jacket’s “visions”? And so on and so forth. Who they hell is this guy and why does he keep me free stuff? When Jacket is asked “do you like hurting other people?”, it’s just one of four questions. The others being: “who are leaving messages on your answering phone?”, “where are you right now?” and “why are we having this conversation?” Apart from the first of those three, the game doesn’t seem to provide any clear answers. Some have this interpreted as Dennaton telling its audience that solid, well-designed gameplay mechanics negate narrative. It’s possible, but I don’t really buy it. The game is driven and held together by a narrative, no matter how incoherent. For me, the gameplay was fun to begin with, but I quickly got bored of the repetitive action and maps. After that point, I only really continued to play because I was curious to know how it would resolve. Would so many people have enjoyed Hotline Miami if it was no more than a sequence of maps with nothing in between? I’m not so sure. It has also been suggested that the two player characters are metaphors. Jacket kills without question, but Biker wants answers (well eventually) and turns against the engineers (i.e. the developers). Jacket represents those who enjoy a game purely for the mechanics, whereas Biker requires context and narrative. But is it so black and white? Many puzzles games don’t have any sort of narrative – a classic example would be the inexplicably-addictive Tetris. Portal doesn’t need a plot but it’s a better game for it. In contrast, LA Noire has a well-written narrative, but the gameplay is weak and unrewarding. Whereas Max Payne perfectly combines compelling gameplay, a brilliant story and great humour. Perhaps the point Hotline Miami is really making is that it’s about the whole package? But if Dennaton are commenting on game structure, I just don’t think it’s that clear what they’re trying to say. Overall I liked Hotline Miami. I think it’s a fun, stylish and well-crafted homage to the addictive, fast-paced but punishing arcade blasters of the 1980s. It’s a great nostalgia trip. But at the same time it left me feeling a little empty – it’s an ephemeral game with no real lasting power, not unlike much of its source material. Prior to playing, I’d read so much about how clever, subversive and important it is as a game (although many of these articles make little attempt to explain why), but I found myself surprisingly underwhelmed. It just didn’t live up to my expectations. While I did find it thought-provoking, to a degree, it comes across as a confused mess of ideas and doesn’t really get any particular point across well. Don’t get me wrong, I’m huge advocate of ambiguity in storytelling – I hate having everything spelled out for me. But I have a sneaky suspicion that Hotline Miami uses ambiguity as little more than a device to mask its relative shallowness. There’s also a smugness to it that grated. Like a pretentious sixth-form philosophy student who lacks self-awareness, it’s far too assured of its own cleverness. Perhaps these themes will be better explored in the imminent sequel. I can only hope so. What I think Hotline Miami does show is how important a soundtrack can be in a bringing a game together and driving it forward. And the killer soundtrack is probably enough to make me buy the much-hyped sequel when it releases this spring. Because I’m a sucker like that. There’s actually quite a few times in the game you never have to kill people. But you apparently never noticed because you figured you had to, because of game mechanics. Then wrote an article about how you had no choice…. Therefore proving the games point. Just an fyI. And that’s not a bad thing. I didn’t realize it either… Until my second time through. Game trains you to virtually kill that when it isn’t an objective we still did it. Thanks for the comments. Actually, I already knew that, but these are rare exceptions (eg at the end when the engineers goad you into killing them, but you can let them live, or when you confront Richter in the police station) and don’t believe they change my arguments. As i state in my article, I think the game is a mess of interesting but contradictory ideas and as such any message is lost in the confusion. But that’s just my opinion.